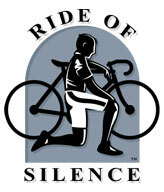 RL and I got the chance to go to the Orange County Ride of Silence. We were lucky because the ride took place on RL’s town and about 8 miles away from my house. I didn’t know what to expect or who to expect. As I was waiting for RL to arrive, I heard a familiar voice, it was Big Rich, my LBS former manager. He introduced me to Marty from The Bicycle Lane Bike shop and other riders that he hangs out with. Needless to say, I was in good company. About 25 riders showed up for the ride. We were all riding all types of bikes; fixies, commuters, singlespeeds, mountain bikes, road bikes and beach cruisers. We rolled out at around 7:20 pm and rode an 8 mile loop throughout the city Fullerton. The ride caught a few bystanders off guard, some cheered, some yelled incomprehensible stuff. Some of the drivers were not pleased with us, there were the occasional idiots that can’t understand that bikes ARE traffic. The ride went without a hitch, (except for a flat tire) all the riders were orderly and respectful. We met Mike Miller, he is the person who organized the ride in memory of his good friend Tod “Einstein” Enneman. Mike has a couple of light projects in www.instructables.com. Check it out. We also met Mountain Bike Hall of Famer Steve Boehmke. He provided us with the Ergon grips to test out. Steve is a legend in the cycling industry and very down to earth, we were very lucky to have met him. RL and I had a great time at the ride, we will be doing it again next year for sure! Those are nice shirts you guys got. How about spreading the wealth a bit. Those are our old jerseys from the days of Team Zoom. Moe happen to do an iron on image of the CBB logo. Jealous!! That looks like it was a lot of fun. WHAT A WONDERFUL THING TO DO FOR TOD ANDREW ENNEMAN.WE ALL MISS HIM SO MUCH!EVERYONE BE SO CAREFUL RIDING YOUR BIKES,IT ONLY TAKES ONE IDIOT AND IT’S ALL OVER!SEE YOU ON THE OTHER SIDE EINSTEIN.YOUR SISTER STACI! What a nice thing to do! I know that Wendy really appreciated it. We all miss Tod. You’re a good friend. Tod Enneman was our daughter Wendy’s husband and father to Schuyler and they were expecting a baby and his name is Saxon. The boys are 9 & 6 years old now and they keep the memory of their Dad Tod through their Mom, Grandparents and people as wonderful as you. Thank you for the beautiful tribute to our Son-In-Law. We miss him very much. May God richly bless you. I am Tod’s Brother-in-law. Thank you to everyone who rode in honor of his memory. He was a very special person, and it touches our family deeply that Mike would organize this ride in his honor. What a beautiful tribute! God bless you! Mikey, basically you are a cycling god. Wish I would have known, but I am so incredibly glad you did it. Our mom’s were friends years ago in Corona, CA…so sorry to hear about Tod. He was my best buddy on the playground. Please tell your mom that ” Louise” says hello. Wow I remember your parents and sister. How are your parents doing?